August Wilson’s magnum opus, the Pittsburgh Cycle, is comprised of ten plays, each exploring the social history of Black Americans in a different decade of the twentieth century. “Two Trains Running” is set in the Hill District of Pittsburgh, PA, in 1969. At that time, great strides were being made in voting rights, civil rights, and women’s rights, but progress was uneven and incomplete, and advancement created its own forms of discrimination. The play has much to offer, but it is dogged by a pedestrian pace, an overly ambitious sweep, and some problematic characterizations. Multi Ethnic Theater’s valiant effort lacks sufficient spark to bring out the best in Wilson’s work. Memphis’s Diner is the setting of the play, but it has been designated for demolition by eminent domain as part of an urban renewal project. The diner’s habitues are older black men, whose discourse is aimless and fatalistic, symbolized by their obsession with gambling the numbers. As played by Bennie Lewis, Memphis is the only character determined to take control of his fate. Lewis’s eyes are fiery, his look fierce, and his voice gruff, whether avowing that he will force the city to give him his price for the diner or barking orders at Risa, the cook/waitress. Though the portrayal works much of the time, it would benefit from variation in tone. Two other focal characters are Wolf, played by Fabian Herd, and Holloway, played by Stuart Elwyn Hall. Herd is visually striking as the self-interested numbers runner who dresses like a preening pimp and fancies himself a great ladies man. Hall also looks his part as the eminence gris — unaspiring, but a thoughtful analyst and philosopher. Sterling, played by Keita Jones, arrives as a strangely naive young man just out of prison. However, the depiction reflects neither a bitterness nor a steely resolve that would amplify Sterling’s personality. Through Sterling, the clash between generations in the black community is revealed. He tries to gin up support for a political rally honoring Malcolm X, but the diner denizens are unenthused. Their train has left the station. And of course, by 1969, a fissure in the civil rights movement had appeared between those who held to Dr. King’s dream and those who argued that progress would not occur without violence. Other divides explored by the playwright are the white/black divide, with different standards and opportunities for the races, and the gender divide, with the female Risa being demeaned by Memphis and objectified by Sterling. This play runs a long three hours, including a brief intermission. This excessive length is one of several flaws in Wilson’s script that undercut the production. For example, a subplot about Hambone, a gentle, but mentally-challenged soul, deals with abuse from within the black community, and could have beeen excised without loss of message. At the same time, some political issues are not well explicated. Some characters like Memphis and Wolf are well developed, yet Sterling’s contradictory actions render him incohesive rather than complex. Director Lewis Campbell ably designed the set representing a poor ghetto diner — partly worn out and partly roughed out. Two booths on either side of the thrust stage abut the front row seats, so that the Gough Street Playhouse becomes even more intimate than usual. Campbell also uses other stage locations effectively for the public phone and the kitchen. Campbell’s direction isn’t as incisive as his set design. Actors are often allowed to speak at normal conversational volume, resulting in mumbled diction and a lack of energy on stage in a play that demands emotive acting to keep the audience fully engaged. Better guidance to actors would help them more effectively define their characters. Finally, it is disconcerting to hear stage directions voiced to introduce each scene, as if it were a rehearsal rather than opening night. “Two Trains Running” plays at Gough Street Playhouse in San Francisco, through August 30. For further information click here. 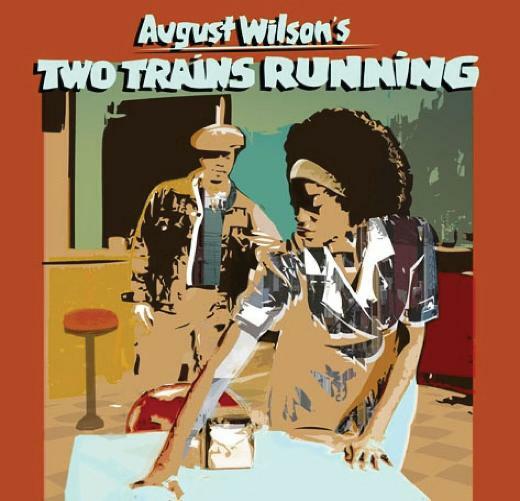 “Two Trains Running” by August Wilson, produced by Multi Ethnic Theater. Director: Lewis Campbell. Scenic Design: Lewis Campbell. Music Selection: Stuart Hall and Charles Johnson. Memphis: Bennie Lewis. West: Vernon Medaris. Wolf: Fabian Herd. Risa: Beverly McGriff. Holloway: Stuart Elwyn Hall. Hambone: Anthony Pride. Sterling: Keita Jones. Posted in Reviews.Tagged Anthony Pride, August Wilson, Bennie Lewis, Beverly McGriff, Charles Kruger, Fabian Herd, Gough Street Playhouse, Keita Jones, Lewis Campbell, Multi Ethnic Theatre, San Francisco Theatre Reviews, Stuart Elwyn Hall, theatrestorm, Two Trains Running, Vernon Medaris, Victor Cordell.